Homemade Pasta and a Chocolate Cake for dessert. In order to wow some cousins coming over for lunch today, I made homemade pasta. 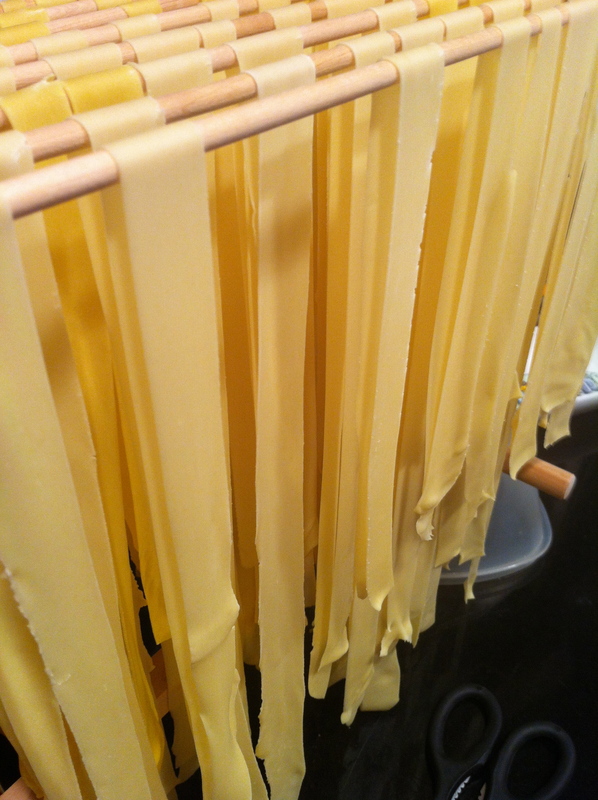 I love making homemade pasta. *Love it! * It’s super easy and impresses the pants off people. I’ve made pasta with fancy machines and with my fingers. I’ve rolled out pasta with machines, rolling pins, wine bottles, just about everything possible. In 2007 on a family trip to Italy I decided to make homemade pasta to accompany some Crema I bought from a DAIRY FARM in Parma. I bought the cream from the PARMAGIANNO REGIANNO cheese making cows. Huzzah! For cream that amazing it needed to be showcased by something just as special – hence the homemade pasta. My mom still laughs at how I had all the spoons in the kitchen balanced sideways on wine bottles so I could spread out the pasta and let it dry! A little flour, 3 eggs and a pinch of salt is all it takes to make yummy pasta. AND – get this – I just learned a super fast way to mix the dough together: The Food Processor. You dump in the flour, pulse a few times to aerate it, add in the whole eggs and a pinch of salt and blend away. If it’s a little like sand or large crumbs you add in water by the Tablespoon until the dough comes together into a single semi-sticky clump. You turn the dough onto some plastic wrap and wrap it over a few times to cover, setting it aside for 30 minutes or shove it in the fridge til tomorrow. I got the handy-dandy pasta attachment for my kitchen aid (YAY! Parents!) to roll out the dough. 1- Flour > Food Processor, pulse to aerate. 2- Add eggs and salt. 3- Process til it combines, adding 1T of lukewarm water at a time until the dough combines. 4- Turn out into plastic wrap and cover. Set aside for at least 30 minutes (or refrigerate til you have time to roll out – just let it come to room temp on the counter when you’re ready to roll out the dough). 5- Roll out the dough. Use a KitchenAid Pasta Attachment, a hand-cranked roller, a rolling pin, a bottle of wine, anything handy. 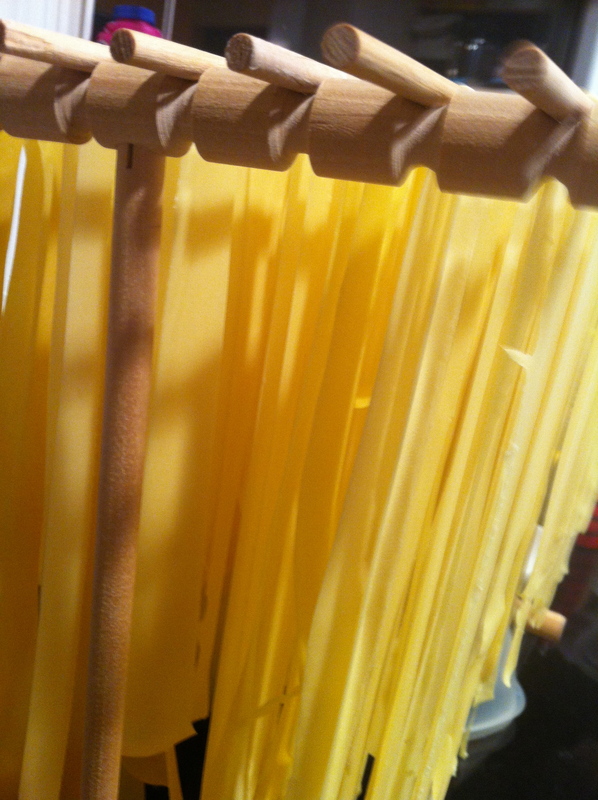 Hang up the pasta strands to dry – or use it in sheet form for lasagnas. 6- Add a lot of salt to tap water in a large pot and then and set it on stove. When it comes to a boil add the pasta – it’s VERY fast. Will only take 2-3 minutes to completely cook the fresh pasta. BTW – You should have your sauce ready to go before you add the pasta into the water. *sigh* I’ve made that mistake before…. It looks so pretty hanging there! 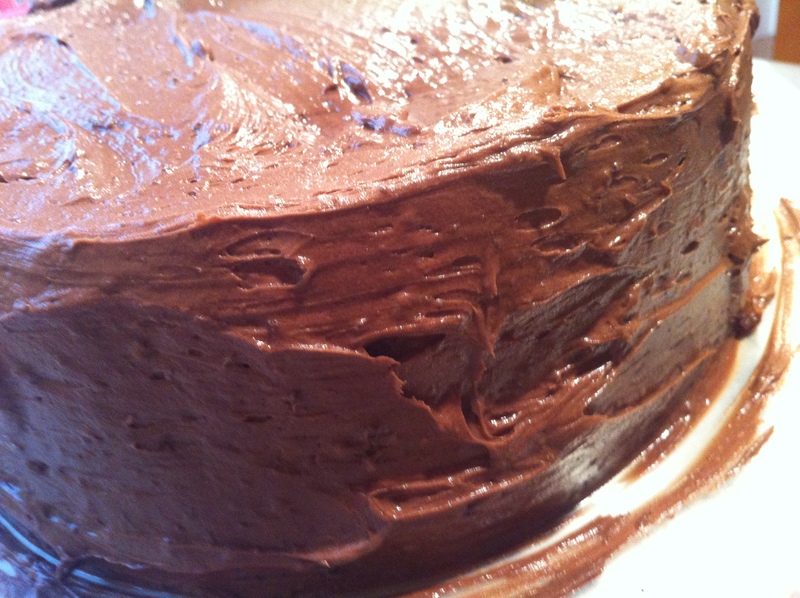 I used wax paper to catch the messy swipes of chocolate frosting. 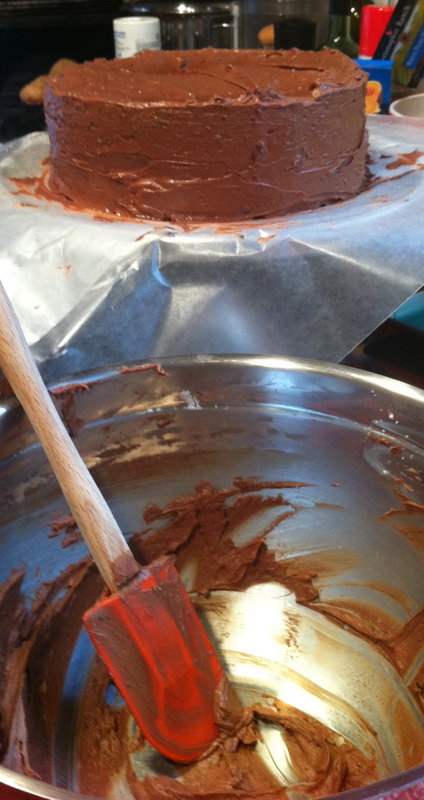 I – yet again – used America’s Test Kitchen’s recipe for frosting. This is usually C’s job – but he’s cleaning gutters out. I think that’s a totally fair swap. Oh – instead of the vanilla you’re supposed to use in the recipe I swapped it for PRINCESS extract. Yup. PRINCESS. I bought it to use for E’s Princess Birthday Party this June and got like a gazillion compliments on it. 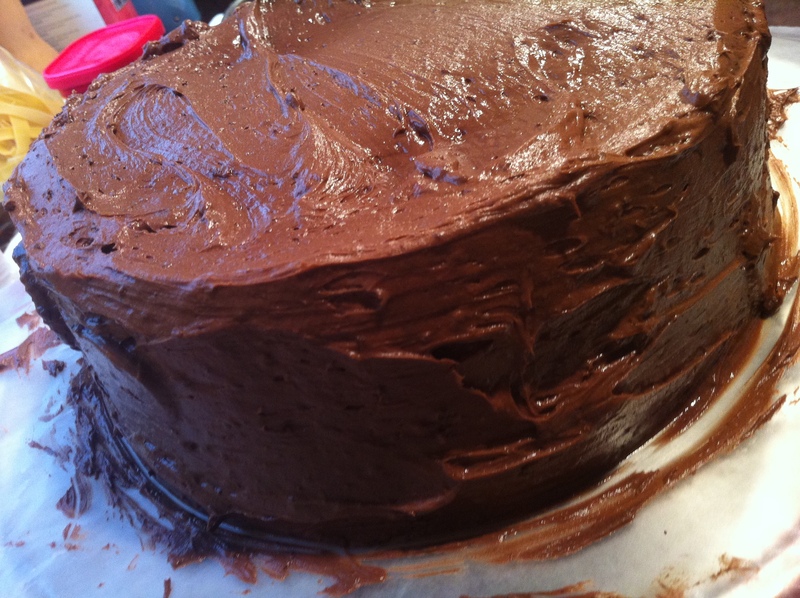 4- Add in the cocoa powder & extract and beat until the frosting is light and fluffy (4-8 minutes). 5- Try not to lick the whole bowl.